Have you ever picked up a book to read because you really liked the movie? It’s become common for books to be made into movies and in many cases no one bothers to read the book before they see the movie. What people forget is that the book has so many more details, descriptions, and activity than can be fit into an hour and a half long movie. Often the movies are really well done interpretations of the books, but that doesn’t mean that the book isn’t still much better. 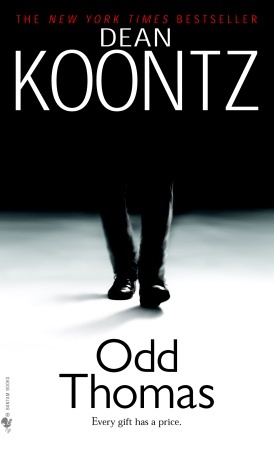 Odd Thomas by Dean Koontz was turned into a movie in 2013. It was a pretty good movie starring Anton Yelchin and William Defoe. Odd Thomas is a young man from a small town in California named Pico Mundo. Yes, his name is actually Odd, that’s not a typo. He is rightly named because he was born with supernatural abilities, one of which is seeing ghosts. Although ghosts don’t talk, Odd can see them and many times they seek him out for justice. When they touch him they feel like normal people and can sometimes show him the tragedy that ended their lives. Conveniently, Odd has a great relationship with the local sheriff, who knows his secret, and with whom he helps seek justice for the ghosts he sees. Beyond seeing ghosts, Odd has a few other abilities that are harder to describe but involve being able to ‘psychically’ find people he’s looking for as well as sometimes having prophetic dreams. Other than this, he’s a normal twenty-year old fry cook at the Pico Mundo Grill. Although he tries to live a simple life by working, helping out when necessary and enjoying his life, he is continually drawn into situations, some of which readers hear about and some we see. Today, Odd wakes from a disturbing dream that he tries to brush off only to find himself faced with a supernatural situation. Nothing about what he’s experiencing makes any sense but he can ‘feel’ it leading to some terrible, disastrous end. He is forced to follow clues and puzzle together what is happening in his small town and, hopefully, save the day. Odd Thomas is the beginning of a series of books that follow the life of, obviously, Odd Thomas. As He finds himself drawn into new situations as each book progresses, until he comes full circle. If you enjoy mysteries, paranormal reads or are just a Dean Koontz fan you will really like this series. Following Odd Thomas through the twists and turns of his life and experiencing this mysterious web of sinister plots was really fun. Although seeing the movie first does take away from some of the ‘who-dun-it’ mystery, there is so much not included in the movie that it was still really worth it. Continuing to read the rest of the series was enthralling as Odd meets some great characters and gets himself enmeshed in some really interesting situations. Susana Goldman is the Associate Director of Operations for the Alamance County Public Library system. She can be reached at sgoldman@alamancelibraries.org. June Summer FunBuild A Better World at Your Library This Summer!